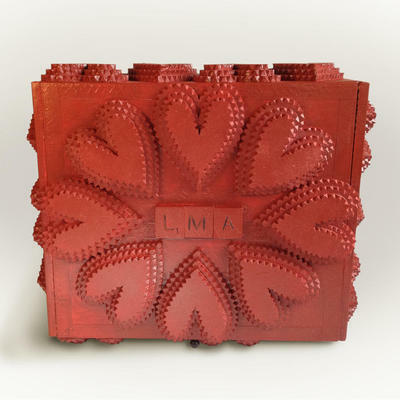 Made from a cigar box, this piece has a heart motif and the initials L.M.A. The lid lifts off to reveal four antique German porcelain dolls and the interior is lined with pages from an 1800's copy of "Little Women". Approximately 70 hand-cut and carved pieces of wood were used in creating this one-of-a-kind work of art. This piece was donated to an auction to benefit another artist and friend, Paul Gordon. I am pleased to let you know it brought $525.00.